Due to the enormous proliferation of internet traffic, including video on demand and transfer of datarich documents, the use of optical networking is mandatory, resulting with high capacity and speed as needed. In this chapter we review optical networking, its current issues, trends, and ways to efficiently design and manage a wide range of optical networks. We address the following: an overview of optical networking (including its current capabilities, virtual versus physical topology, optical node components), placement of “special equipment” nodes and components, and design of network topology. Efficient management and utilization of geographically different networks (such as wide area networks, metro networks, and access networks) present different optimization problems dealing with the placement of special optical equipment. We summarize current algorithmic approaches and suggest possibilities for further research. The ever-increasing demands for internet usage and transfer of data-rich documents mandate the use of optical networking. Light is a form of energy represented as an electro-magnetic wave. It can be induced by stimulated emission (by lasers) producing photons that can travel in a fiber optic medium. As a wave, it has a wavelength, i.e. a distance between repeating units of its pattern. Currently, wavelengths are measured in 1000s of nanometers. Wavelength Division Multiplexing (WDM) is a technology that multiplexes different wavelengths onto a single fiber, in effect multiplexing various optical signals (channels). This increases the capacity of the optical medium. The capabilities of optical networks constantly increase, and in 2007 they are as follows: a wavelength channel can carry up to 40 Gb/s data; transmission supports up to 160 wavelengths per fiber using WDM; more than 800 fibers can be packed per cable. Just to illustrate the enormous speed, note that one DVD movie will be transferred in a second if there is a speed of 5 Gb/s. Hence, 40 Gb/s amounts to transferring about eight full DVD movies in a second! Wavelength is inversely proportional to frequency (smaller wavelength, higher frequency) and it is related to the speed of data transfer. A measure of frequency range, measured in Hz, is called the bandwidth. Hence, “bandwidth” is closely related to data transmission rates. Nowadays customers require more and more bandwidth and just adding more wavelengths, without trying to bring down the unit bandwidth cost, will not be economically justified: the increase in bandwidth would not be followed by an adequate decrease in equipment cost. Hence, there is a need to carefully design and manage networks, using optimization techniques to efficiently utilize network resources. In sum, the main current trend in telecommunications is the increased demand for high bandwidth and speed motivated by bandwidth-hungry applications such as the use of the internet, transmission of video and interactive gaming. A related trend is unpredictable bursty traffic due to heavy and unpredictable downloads. Traffic due to the transmission of voice can be modeled by a Poisson probability distribution, however, bursty traffic is self-similar and presents problems when allocating resources based on predictions; this creates design challenges when trying to allocate network resources and motivates the need for so-called “intelligent networks” which can perform automated provisioning. Another trend in contemporary telecommunications is the increased need for transparency and reconfiguration in order to achieve the required speed and to deal with un-predictable traffic. Finally, the design of network topology is moving towards irregular meshes since they are more scalable and fit better the underlying physical network of fiber cables. 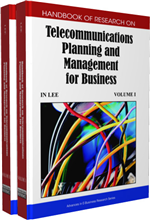 As already indicated, the challenge in telecommunications planning and management for business arises from trying to consolidate revenue growth with enormous bandwidth demand. If there is no optimization of network resources, the unit bandwidth cost will be too high, resulting with too slow revenue growth, or with no growth at all. This indicates a need to design and manage network architectures with reduced unit bandwidth cost. The unit bandwidth cost may be reduced by operating networks with appropriately placed and reduced switching/routing equipment and port cards. In other words, in order to achieve savings on operating expenses (OPEX), there is a need to maximally utilize optical technology in creating a network with a small number of expensive devices, yet a network capable to deliver the required capacity and Quality of Service (QoS). This necessitates careful decisions about placing devices such as: amplifiers, passive splitters, monitors, wavelength converters, optical cross-connects, i.e. switching and routing equipment. In addition, reduced port cards call for a smaller number of transmitters (lasers) and receivers (filters). This chapter will address a number of equipment placement problems arising in optical networking, in geographically various networks such as backbone, metro, and access networks. In addition, we consider strategies for traffic grooming which are necessary to efficiently utilize the huge available bandwidth, in turn providing economic incentives for users as well as network operators. Optical Add-Drop Multiplexers: Selectively remove a wavelength from a set of wavelengths then add the same wavelength with a different data (can add and drop traffic). Optical Switches: Perform cross-connecting channels and provide reconfiguration either at the wavelength level, or at the fiber level. Light Amplification by Stimulated Emission of Radiation (Laser): Is a light source and converts electrons to photons, or performs electro/optic conversion. Optical Amplifiers: Amplify signals in the optical domain (regeneration); repeaters amplify after conversion to the electric domain. A single amplifier can simultaneously amplify all wavelengths. Basic types of amplifiers: Erbium-doped fiber amplifiers (EDFAs), semiconductor optical amplifiers (SOAs) and Raman amplifiers. An EDFA is a fiber segment, a few meter long. Raman amplifier is based on the nonlinear optical effect. While EDFAs provide a large gain over a short distance, the Raman amplifier provides a small gain over a large distance (and requires long fibers with high-power pump lasers). Wavelength Routed Networks: Allow all-optical connections (lightpaths) between pairs of nodes. Namely, there is no opto/electric conversion at transitive nodes; the whole path, possibly traversing many physical links, is completely in the optical domain. Wavelength Converters: Convert one wavelength signal to another. SOAs (semiconductor amplifiers) are used as wavelength converter devices. Asynchronous Transfer Mode (ATM): Is a cell relay, packet switching network and data link layer protocol. Optical Network Components: Active components are electronically powered (lasers, wavelength shifters (converters), modulators). Passive components are not electrically powered and cannot generate light on their own (fibers, multiplexers, demultiplexers, couplers, isolators, attenuators, circulators). Optical modules are devices with active and/or passive optical elements such as transceivers, erbium-doped amplifiers, optical switches, add/drop multiplexers.